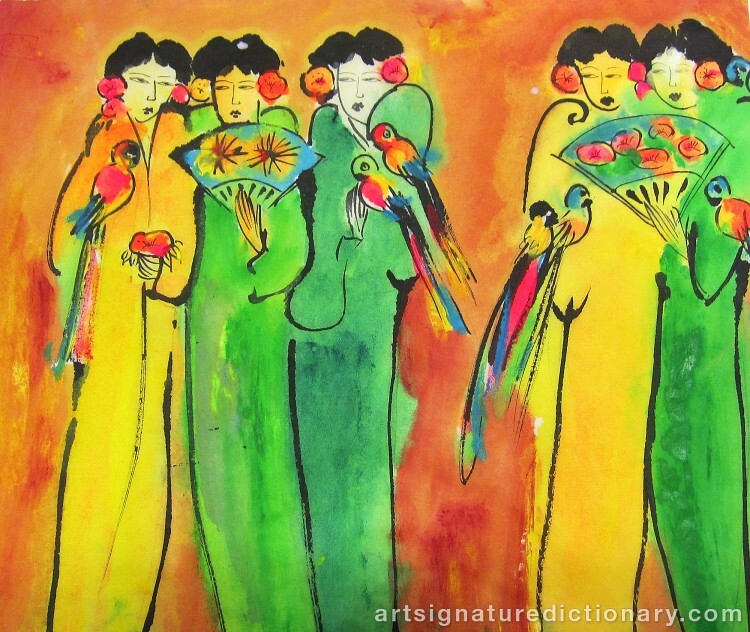 Mixed media on paper, depicting women and parrots, signed so bad that it can not be distinguished, 30x36 cm. 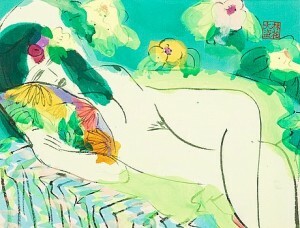 The painting was cataloged in a major auction house. Estimated price 30000-35000 SEK. Experts have judged the painting different from Tings way of painting women, and that the painting is of very poor quality. The District Court's judgment: The painting 're not made of Walase Ting. The painting has been forfeited. Blandteknik på papper, föreställande kvinnor och papegojor, signerad så dåligt att den inte går att urskilja, 30x36 cm. Målningen var katalogiserad hos ett större auktions hus. Estimated pris 30000-35000 SEK. Experter har bedömt målningen avvikande från Tings sätt att måla kvinnor samt att målningen är av mycket dålig kvalitet. Tingsrättens bedömning: Målningen är inte utförd av Walase Ting. Målningen har förverkas. Autodidakt billedkunstner, skulptør, grafiker og poet. Studerede i en kort periode ved Shanghai Kunst Akademi før han sejlede til Frankrig, hvor han ankom til Paris i 1950 uden penge, venner eller husly. Efter 8 år i Paris havde Ting opbygget meget tætte forhold til flere af COBRA kunstnerne, specielt Pierre Alechinsky og Asger Jorn. 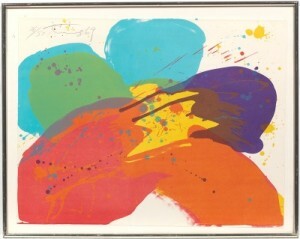 Ting tog til New York i 1958 og møder Sam Francis, samtidig med at den abstrakte ekspressionisme er på sit højeste. De to kunstnere bliver meget tætte venner, og Ting lader sig tydeligt inspirere af Francis. Børge Birch mødte Walasse Ting gennem Pierre Alechinsky, som anbefalede ham, at lave en udstilling i Galerie Birch i København. D. 5.dec. 1960 åbner Galerie Birch dørene til den første udstilling med Walasse Ting, med 19 malerier og 8 keramiske fade. Succesen er stor og der bliver gentagne udstillinger – igen i 1963, 1972, 1973, 1975, 1980 og 1981. I 70’erne udvikler Ting sin karakteristiske stil og begynder nu i modsætning til i Paris at sælge masser af billeder. Efter mere end 20 succesfyldte år i New York flytter Ting til Amsterdam, hvor han har sit atelier. Walasse Ting er let genkendelig på sin farvestrålende, klare palet med det særegne lys, sit figurative motivvalg og nærmest flamboyante stil. Hans forførende og magiske verden er en fornøjelse for sanserne og appellerer til dem, der deler hans passion for skønheden i den naturlige verden. Kunstneren anvender akrylen virtuost, så den fremtræder fjerlet og transparent som akvarel. Walasse Ting blev i 1970 beæret med The Guggenheim Fellowship Award for Drawing. Galerie Birch har kendt og samarbejdet med Walasse Ting i mange år og har et indgående kendskab til hans værker. 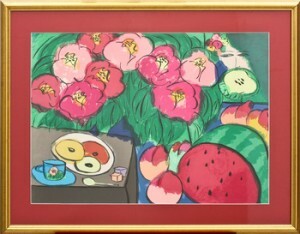 Walasse Ting studied in a short period at the Shanghai Art Academy before sailing to France where he arrived to Paris in 1950, without money, friends or shelter over his head. After 8 years in Paris had Walasse Ting finally build close relationships to several of the COBRA artists, especially Pierre Alechinsky and Asger Jorn. Ting travels to New York in 1958 and meets Sam Francis at the same time when the abstract expressionism is at its highest. The two artists becomes very close friends and Ting is obvious inspired by Francis. Børge Birch becomes acquainted with Walasse Ting through Pierre Alechinsky, which recommended him to make an exhibition in Galerie Birch, Copenhagen. The 5th December of 1960 opens the doors in Galerie Birch to the first exhibition with Walasse Ting, with 19 paintings and 8 ceramic plates. The success is great and it’s followed by other exhibitions again in 1963, 1972, 1973, 1975, 1980 and 1981. 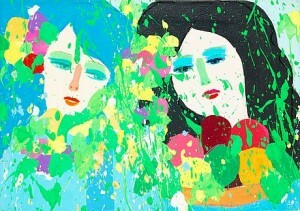 In the seventies develop Ting his characteristic style and in contrary to in Paris, he begins to sell a lot of paintings. After more than 20 successful years in New York, moves Walasse Ting to Amsterdam where he has his studio. Walasse Ting is easily recognizable on his colourful, clear pallet with the peculiar light, his figurative motif choice and almost flamboyant style. His seducing and magical world is a pleasure on the senses and appeals to those who share his passion for beauty in the natural world. The artist uses acrylic with virtuosity so it appears feather light and transparent like watercolours. Walasse Ting was in 1970 honored with The Guggenheim Fellowship Award for Drawing. 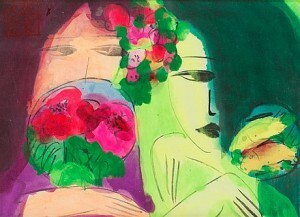 Galerie Birch has known and cooperated with Walasse Ting in many years and have a thorough knowledge of his artworks.